2020 is a very special year for fans of the great Anne Brontë, because it marks the 200th anniversary of her birth in Thornton, Bradford – the last of the six Brontë siblings. Keeping the theme of 20 going, it’s now 20 months until the end of that year, and that means there’s no time to waste when it comes to preparing for Anne Brontë celebrations and events. With that in mind, I’d like today to announce that I’ve launched a new website specifically for that purpose: www.annebronte200.com. Don’t worry, this website will continue exactly as it has done for the last few years, with posts about Anne Brontë and her family on at least a weekly basis. 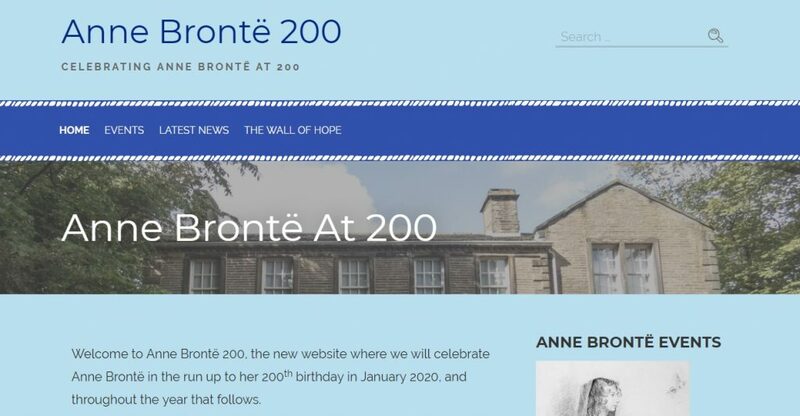 The Anne Brontë 200 year is a very special occasion, however, and one I felt deserving of its own dedicated website. I’ve already had lots of people emailing me, or talking to me, to see if I have details of upcoming Anne Brontë celebrations next year. In short, I didn’t, so I’m going to gather information on as many of these events and publications as possible, and publish them here. Doubtless the Brontë Parsonage Museum in Haworth will be planning their own events for 2020, and I look forward hugely to finding out about them, but I know myself and others are also holding Anne Brontë events in the next 20 months. They’ll all be listed on my Anne Brontë 200 website – in short, it will be a one stop shop for news on Anne Brontë events throughout this year and next. I love Anne Brontë, and I know so many of you out there, in all corners of the world, love her as well – so if you have any information or events you’d like me to publicise simply email me at annebronte200@hotmail.com. I’d be absolutely delighted to hear from you. The website will also feature a wall of hope – more information on that will follow in the early summer, but it will be a chance for all of you to get involved and share your love of Anne, after all she belongs to each and every one of us who reads and enjoys her books. We’ll also have a chance to support a fantastic and very relevant charity, and at the end of the year create a wall of hope in Anne Brontë’s name. 2020 is a once in a lifetime opportunity to showcase Anne Brontë as a brilliant writer, and as a brilliant human being. The new website will feature daily updates throughout 2020, with your help, and together we will ensure that next year really is a year of celebration from beginning to end – a Year of Anne! What a great idea, and a fitting tribute to Anne! I can’t wait to see what you (and everyone else) has in store for 2020. Next Next post: Why Did The Brontë Sisters Turn To Novels?